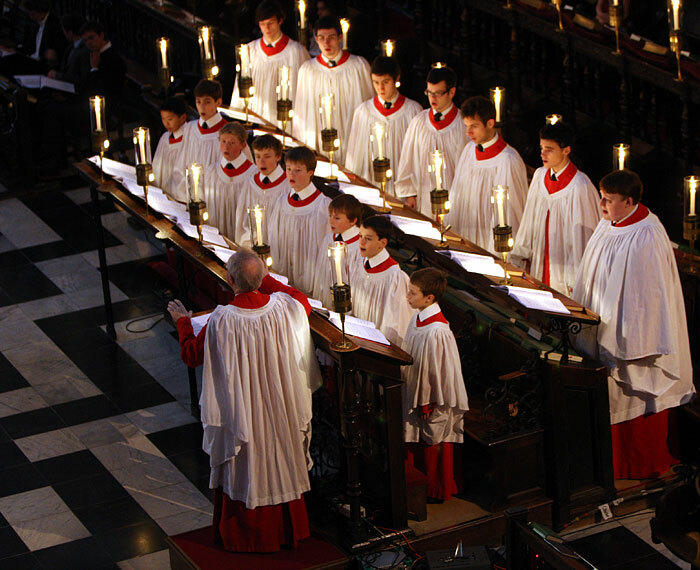 Though the Festival of Nine Lessons and Carols as celebrated at King’s College, Cambridge is an elaborate feast of sight and sound, its pattern is clear to anyone familiar with the Daily Office. Interspersed between the lessons are musical responses — carols and hymns — in place of the canticles we use in the Offices day by day. The service of Lessons and Carols, like the Daily Offices, concludes with collects appropriate for the season. Though the Festival of Lessons and Carols was planned in 1918 out of Dean Eric Milner-White’s felt need for “more imaginative worship,” its roots in the Prayer Book pattern of Morning and Evening Prayer are deep and nourishing. O God, who makest us glad with the yearly remembrance of the birth of thy only son, Jesus Christ: Grant that as we joyfully receive him for our redeemer, so we may with sure confidence behold him, when he shall come to be our judge; who liveth and reigneth with thee and the Holy Spirit, one God, world without end. Amen. O God, who by his incarnation gathered into one things earthly and heavenly, grant you the fullness of inward peace and goodwill, and make you partakers of the divine nature; and the blessing of God Almighty, the Father, the Son and the Holy Spirit, be upon you and remain with you always. Amen. In the strength of Christ we find not only rest but nourishment for service. This entry was posted in Daily Office and tagged collects, King's College, Lessons and Carols, pattern, Scripture, strength on December 24, 2013 by Rodger Patience.